Cheddar chips don’t stay crispy long, so make them right before serving the guacamole. Guacamole usually taste bests chilled, so either refrigerate the avocados for an hour or two before making the guacamole, or press plastic wrap against the surface of the made guacamole to protect it from air (which turns it brown), and chill for several hours before serving. Preheat oven to 400º F/205º C.
Line a baking sheet with parchment or Silpat. 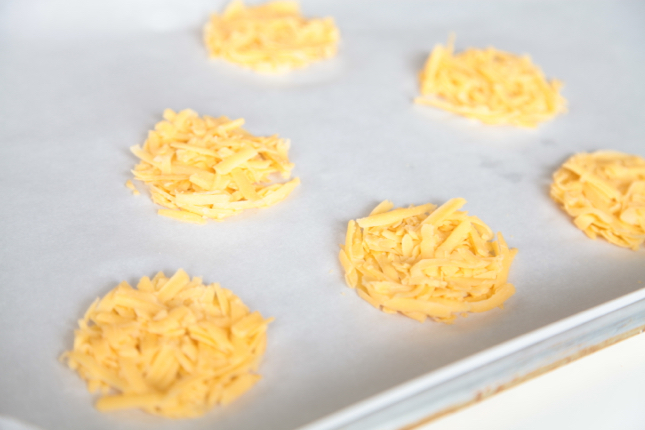 Drop heaping tablespoons of grated cheddar onto the baking sheet. Space the mounds a few inches apart. You should get approximately 16 mounds. Spread the cheddar mounds out into circles about 2 inches/5 cm wide. Bake 8 minutes until the cheese is melted and bubbling. Let the cheese set for a minute until it starts to solidify, then lift the Cheddar rounds off the baking sheet with a spatula. The cheese will quickly cool into “chips.” The Cheddar chips will not be perfectly round; if you want them to be, then use kitchen shears to trim the edges. Prep all the guacamole ingredients, and have them ready so the guacamole can be mixed together immediately after the avocados are cut. Halve the avocados and remove the pits. Use a knife to cut the flesh into small cubes. Scoop the cubed flesh out with a spoon into a medium bowl. 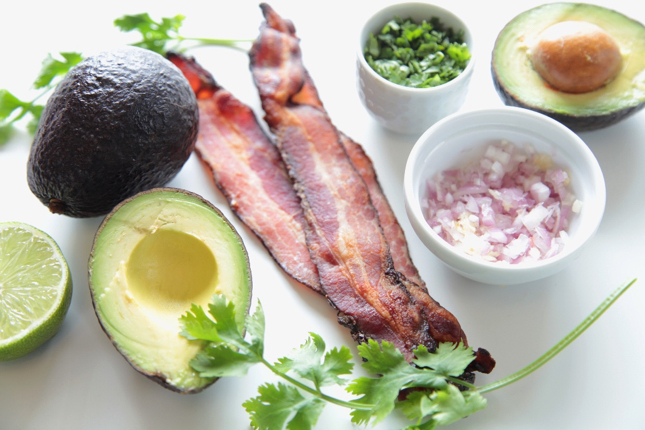 Sprinkle all the remaining ingredients over the avocado: bacon, lime zest, lime juice, shallot, garlic, cilantro, and jalapeno. 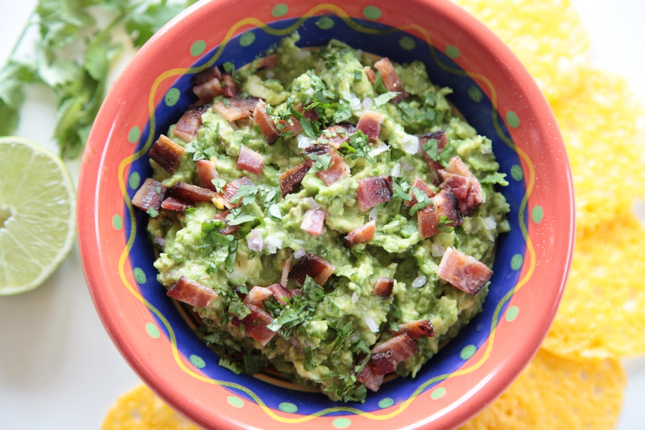 Use a fork to mash the avocado into guacamole with a texture you prefer, either smooth or chunky. Serve with Cheddar cheese chips. In a small saucepan, heat coconut oil and coconut butter over low heat until melted. 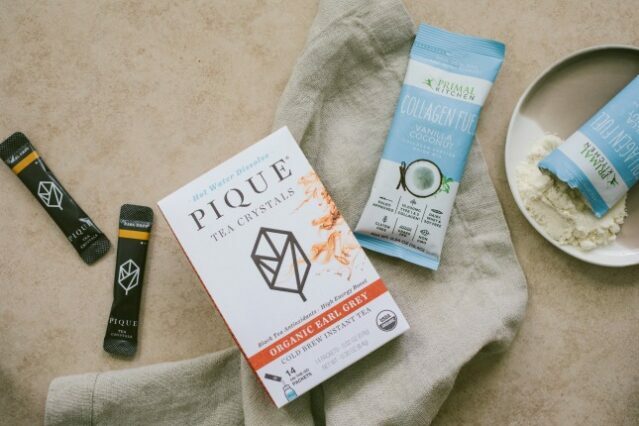 Add Pique Tea Earl Grey Tea sachets, packets of Vanilla Coconut Collagen Fuel, hemp hearts and sea salt into mixture. Blend and mix well until smooth. Pour the mixture in a silicone mold of your choice. 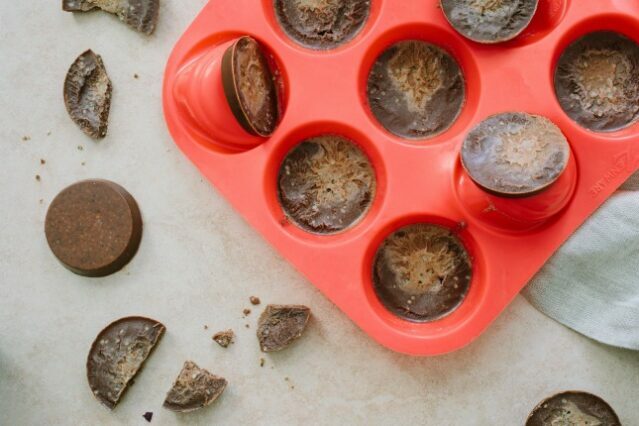 Freeze for 20 minutes until the fat bombs harden. Add rose petals to garnish. Store in the freezer or the refrigerator. Enjoy! 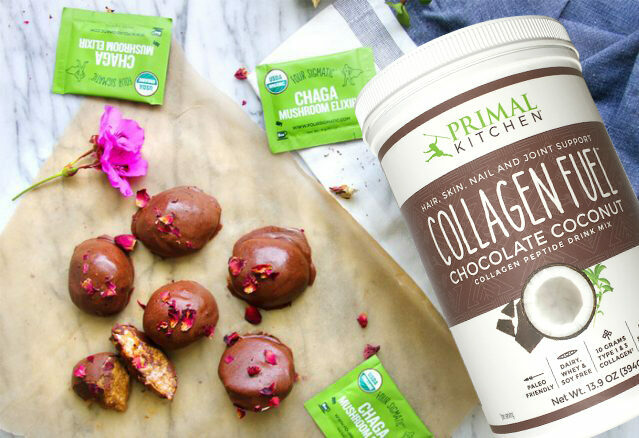 If make-ahead isn’t your thing or for times when you need to grab something and go, Primal Kitchen Protein Bars make a good keto-friendly option. 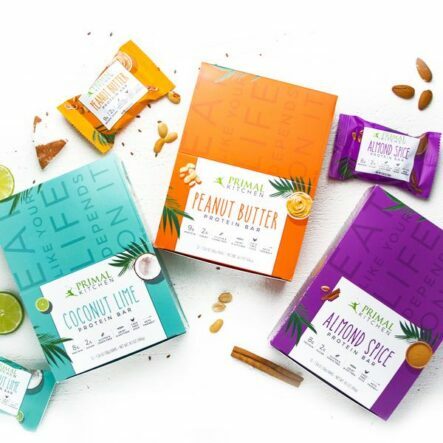 Each bar contains 9–10 grams of carbs, 2 grams of sugar, and 8–9 grams of protein. 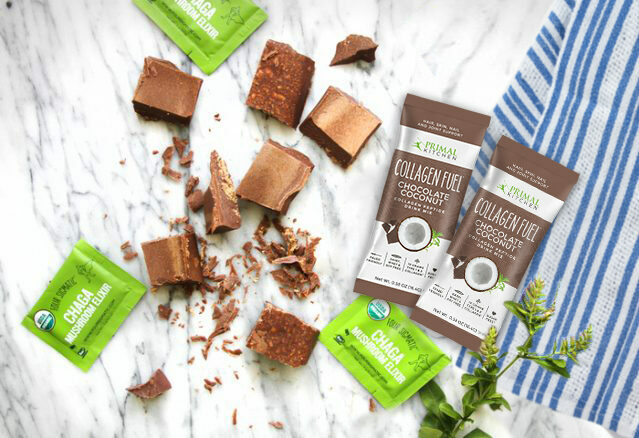 Sweetened with a touch of honey and monk fruit, these protein bars are made with real ingredients, such as cage-free eggs, coconut oil, nuts, and flaxseed—all without a shred of gluten, grain, dairy, whey, soy, or refined sugar. 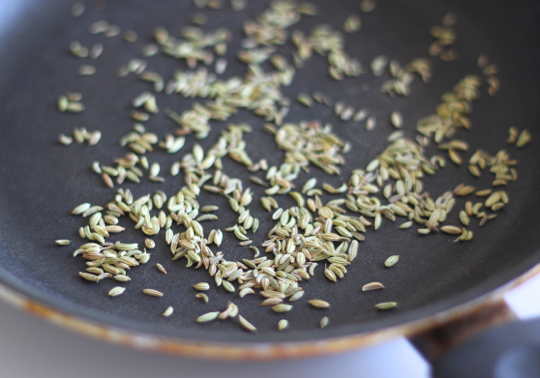 Toast the fennel seeds in a dry pan until the seeds are aromatic and lightly toasted, 2 minutes. Turn off heat. Immediately add the olive oil, hot pepper, rosemary and lemon zest to the pan. 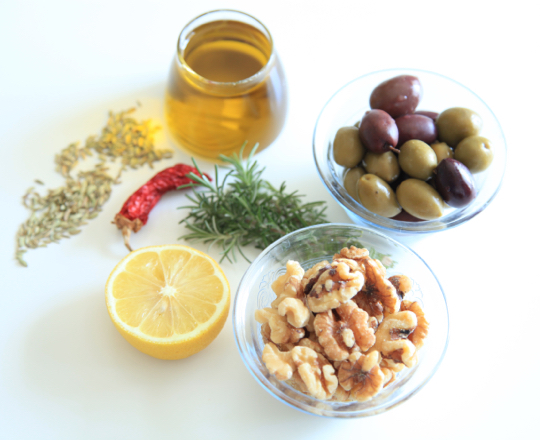 Put the olives and nuts in a large glass jar. Pour the warm oil and seasonings on top. When the oil is cool, cover and refrigerate. 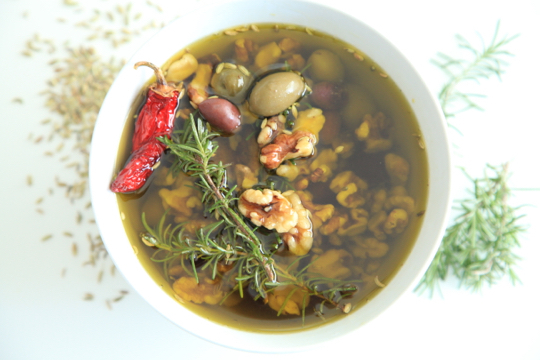 For the best flavor, marinate the olives and nuts at least 24 to 48 hours before eating (they will stay fresh for several weeks in the refrigerator). Bring up to room temperature before serving. Mix 1/2 cup almond butter, 1/2 cup coconut oil, and 1 Tbsp. coconut flour. Place the “dough” in the refrigerator or freezer until it firms up enough to scoop and roll into balls. 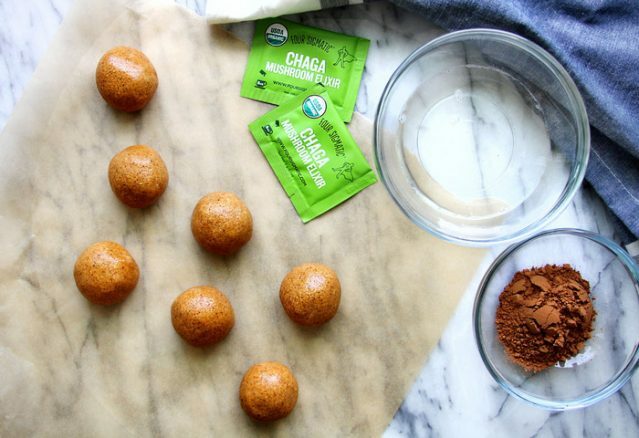 Roll into 1 1/2-inch balls and put them back in the freezer to firm up (about an hour). 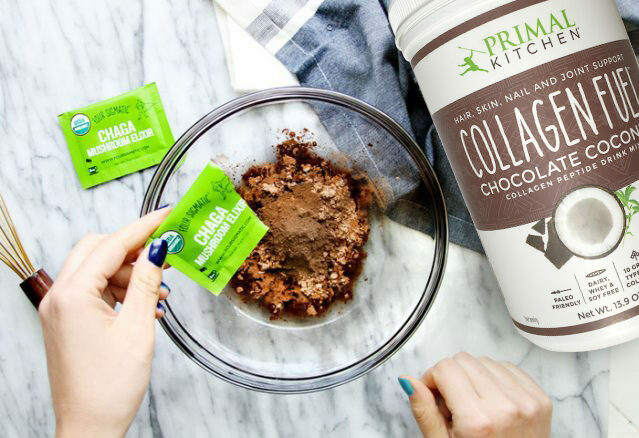 At the end of the hour, make the glaze by mixing 1/2 cup melted coconut oil, 2 scoops of Collagen Fuel, 3 Tbsp. raw cocoa powder, and 1 packet of the Four Sigmatic Chaga in a small bowl until fully blended. 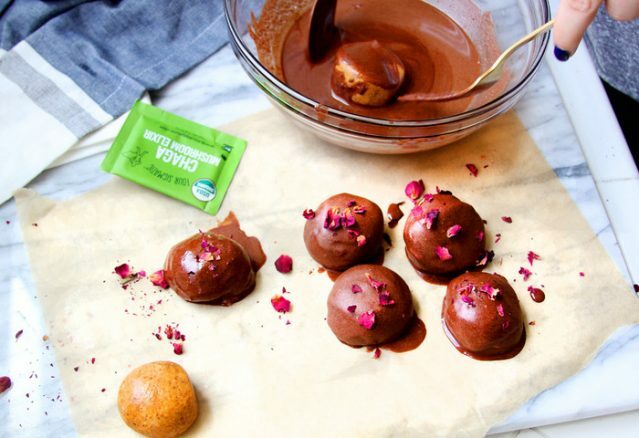 Remove the balls from freezer and coat in chocolate glaze mixture. 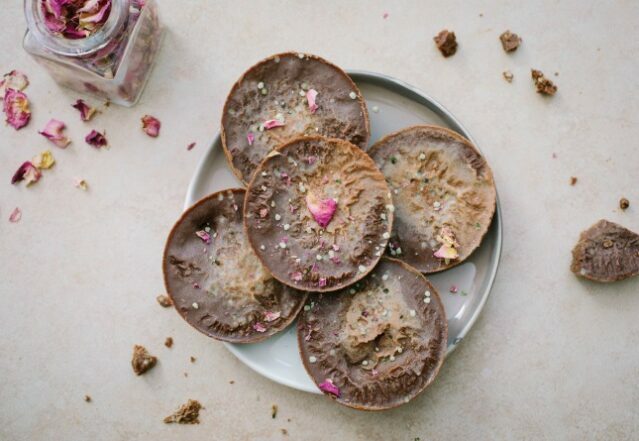 Top with dried rose petals, dark chocolate shavings, or other desired garnish. *The egg white whisked with water is optional, but helps spices adhere better. Line a large baking sheet with foil. Lay the strips of bacon out, spaced so they’re not touching. Put the pan in the oven and turn the temperature up to 400 ºF/205 ºC (no need to preheat). Cook bacon 20 to 25 minutes until crispy. Use tongs to move the bacon onto a plate to cool. Pour the bacon grease out of the pan and set aside. Turn the oven temperature down to 300 ºF/150 ºC. In a large bowl, whisk the egg white and water until frothy. Add in the nuts and seeds, and mix well to coat. Drain the nuts and seeds in a colander for a few minutes, stirring and pressing with a rubber spatula a few times, so excess egg white drips off. 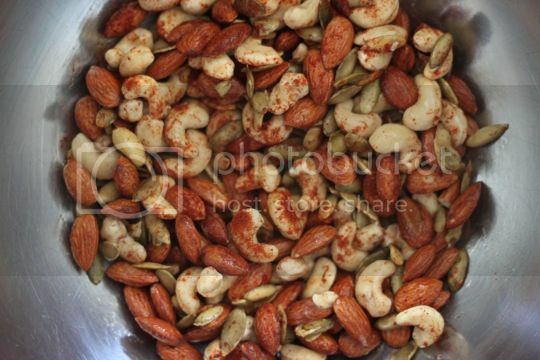 Return the nuts and seeds to the large bowl and add the coconut aminos, paprika and cayenne. Mix well. Pour in the bacon grease and mix well again. Spread the nuts out on the same baking sheet the bacon was cooked on. Roast 30 minutes, mixing once. Remove from the oven and immediately scrape onto a large plate or pan to cool (or it will stick to the aluminum foil). 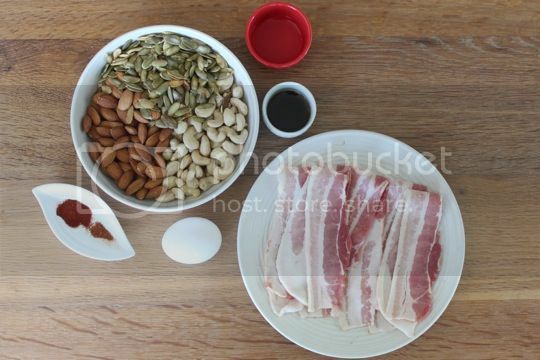 Chop the bacon up into small pieces and combine with the cooled nuts and seeds. Let the nuts cool completely before storing in an airtight container. 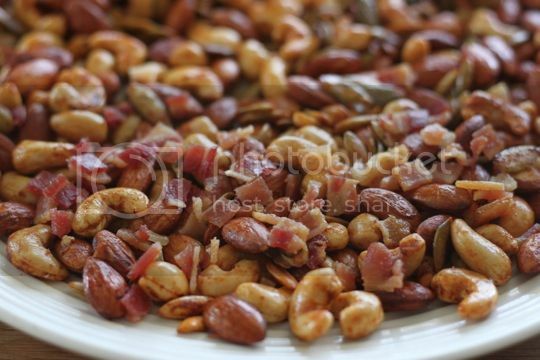 If not eating within 24 hours, store the bacon trail mix in the refrigerator. *The saltiness of tamari can vary between brands. If your first batch of eggs is too salty, cut back on the amount of tamari used for future batches. In a medium bowl, whisk together warm water, tamari, coconut aminos, rice vinegar, ginger and kombu. Set aside and let cool to room temperature. Bring a medium pot of water to a boil. Use a large spoon to carefully set the eggs in the bottom of the pot. For soft-boiled eggs, cook exactly 7 minutes. While the eggs boil, fill a large bowl with water and ice. When the eggs are done, set them gently in the bowl of ice water. When the eggs are cool, peel while holding the egg underwater (this helps the shells come off more easily). 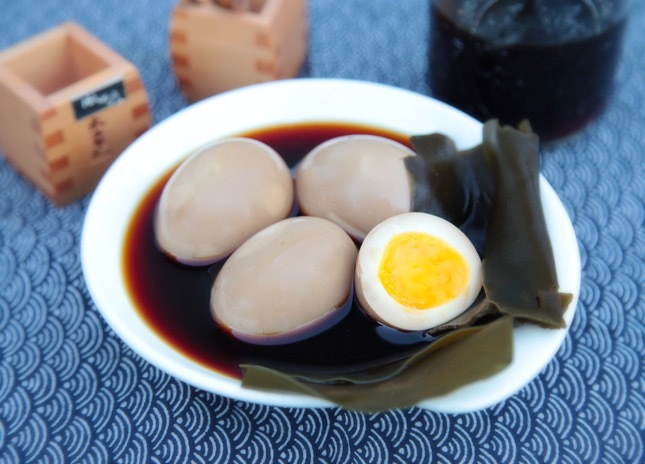 Submerge the eggs in the tamari marinade so they are completely covered. If the eggs aren?t completely submerged, try a different sized bowl or a jar, or, add more water. 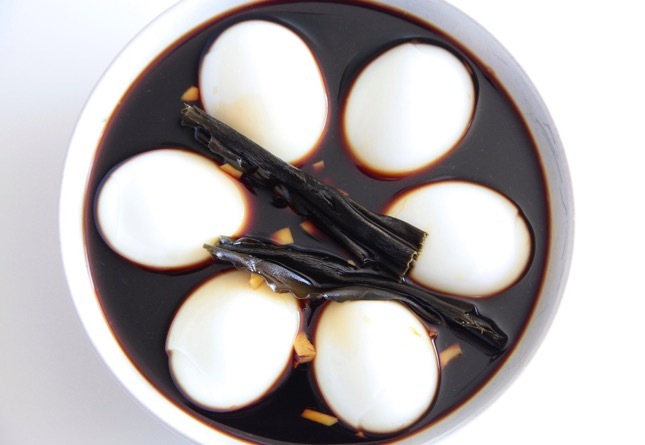 Marinate the eggs in the refrigerator for at least 2 hours and up to 8 hours (after that the eggs tend to get too salty). If refrigerated, the eggs will stay fresh for about a week out of the marinade. 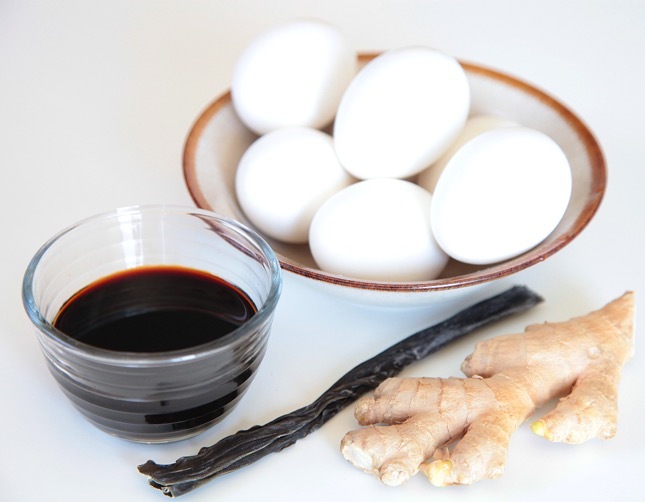 The marinade can be kept in the refrigerator and re-used for more eggs. Should You Supplement While Keto? Why Am I Getting Low Ketone Readings? Is Long-Term Ketosis Necessary—or Desirable? How Does Keto Fit Within the Primal Blueprint Diet? Is Keto Bad For Thyroid Health?